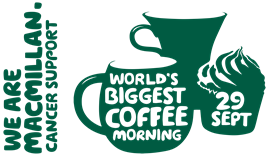 Due to our coffee morning being incredibly popular, we will be hosting TWO Macmillan Coffee Mornings this year. Please come along and join us in the school hall for a cup of tea or coffee and a slice of cake from 9:00am. We hope to raise more than we have before for this wonderful charity. Please help us make this event a success by sharing our post and spreading the word to our local school community.